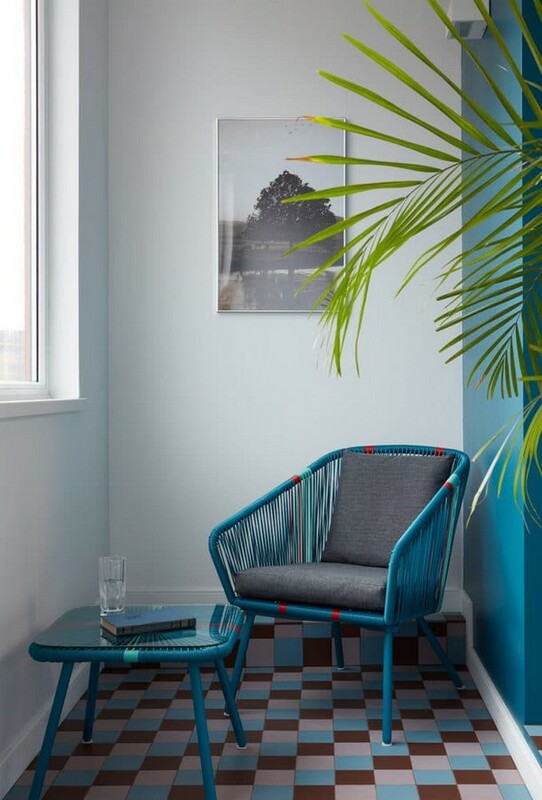 Today’s two-level apartment is not just pretty functional, but also very stylish – deep, saturated accent colors used here are extremely noble – emerald, ochre, purple and azure blue. They make it very individualized and distinctive. The initial layout was transformed considering the peculiarities of the apartment and the owner’s preferences, habits and life-style. Thanks to making the kitchen zone open to the living room, the designer managed to arrange a full-fledged laundry room. Also, thanks to layout modifications the private zone of the dwelling became more functional: the master bedroom got a roomy walk-in closet, a balcony exit and an individual bathroom. All that became possible owing to shifts of door apertures and adding a few partitions and interior walls. 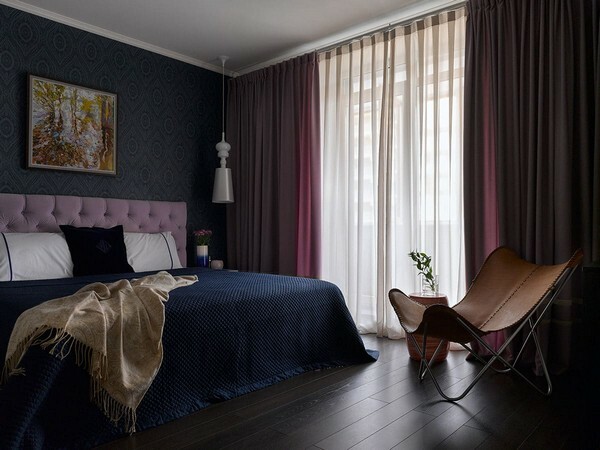 The designer of the project confesses that her favorite stage of interior design is picking the colors. Color is the thing that sets the mood, creates the right atmosphere and determines the character of the interior. 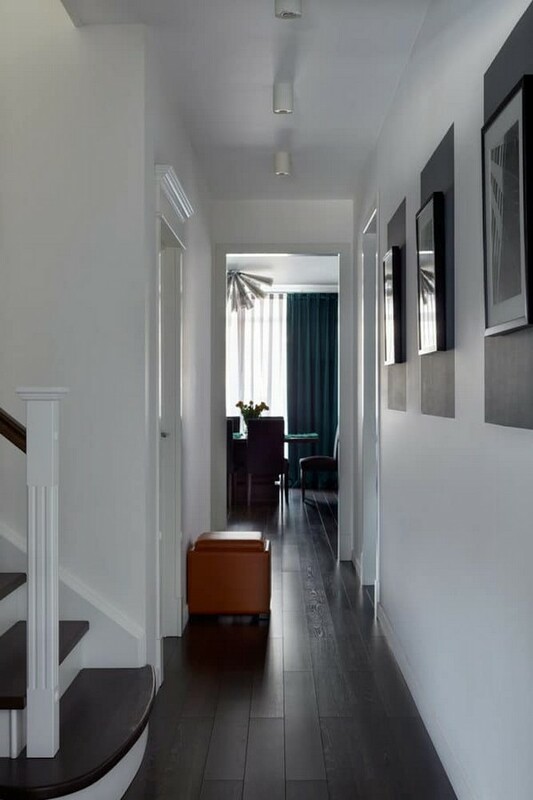 All the rooms of the first level – the entrance hall, kitchen, lounge and corridor are interconnected by means of colors – matching elements practically unite all the rooms into an integral living room space. 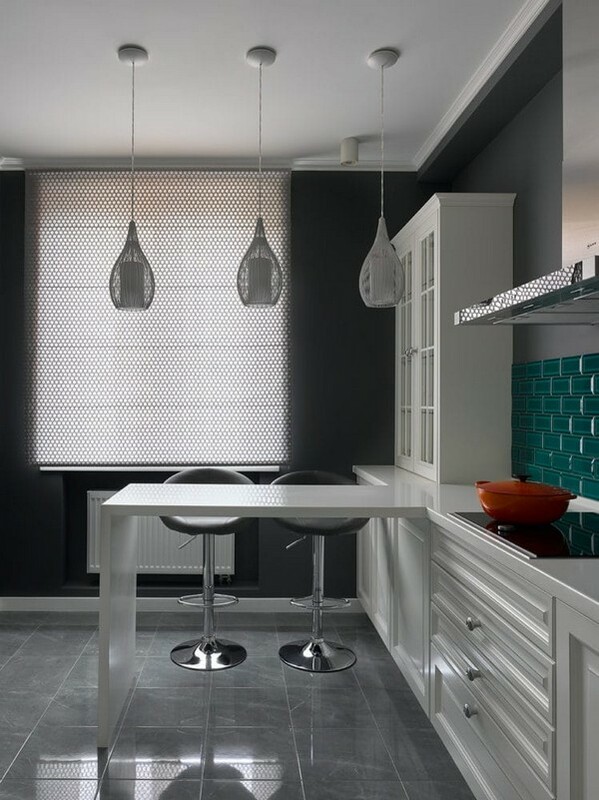 The starting point of the color scheme was emerald tiles of the kitchen backsplash: the decorator bought them practically from scratch as she couldn’t pass by such a beautiful noble color and gloss. 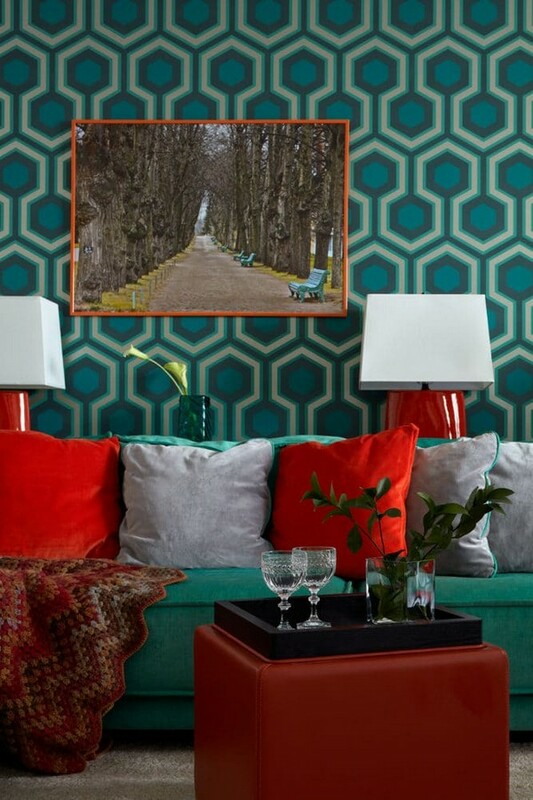 Then appeared matching wallpaper with geometrical pattern in the living room. And finally all of this emerald beauty was framed into a white and graphite background, which perfectly emphasizes all the details and accessories. The private half of the apartment, including a master bedroom and two toddler rooms, features a more reserved color palette, but here color accents were not ignored either. Besides, all the rooms feature optional lighting modes to create a comfortable atmosphere depending on the current task and mood. As soon as the project was time-limited and small-budget, most of the furniture and lighting fixtures were bought in stores, rather than bespoke. A white traditional-style kitchen set is custom-made, and the table top is made of composite stone. 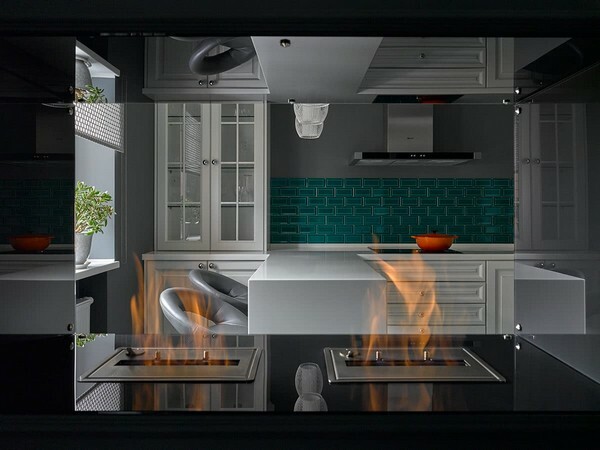 The backsplash is laid with emerald English hand-made brick tiles, while the rest of the walls are coated with graphite paint by Little Green. 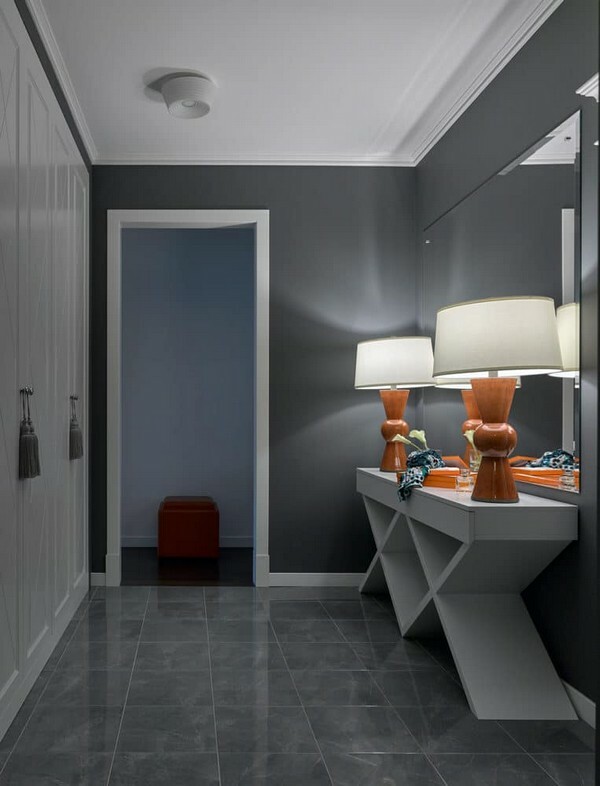 The entrance hall is furnished with a roomy wall-to-wall closet and a custom-designed console. The color accents of the room are a couple of lamps by Crate and Barrel – they look especially good against a noble gray background of painted walls. Bespoke elements of the lounge zone are a solid wooden dining table, a TV stand and a console behind the couch. The accent wall is covered with emerald wallpaper by Cole and Son, and the rest of the walls are plain white. 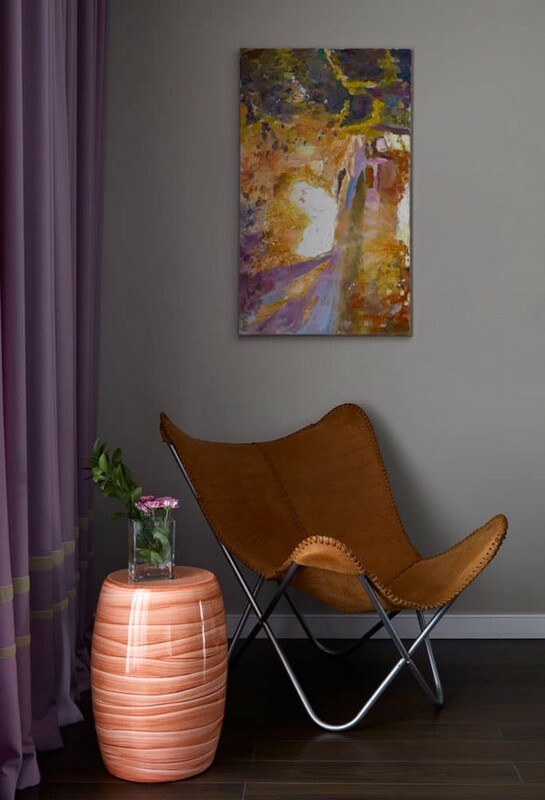 An orange ceramic coffee table by MhLiving is matched by ochre lamps by Crate and Barrel. 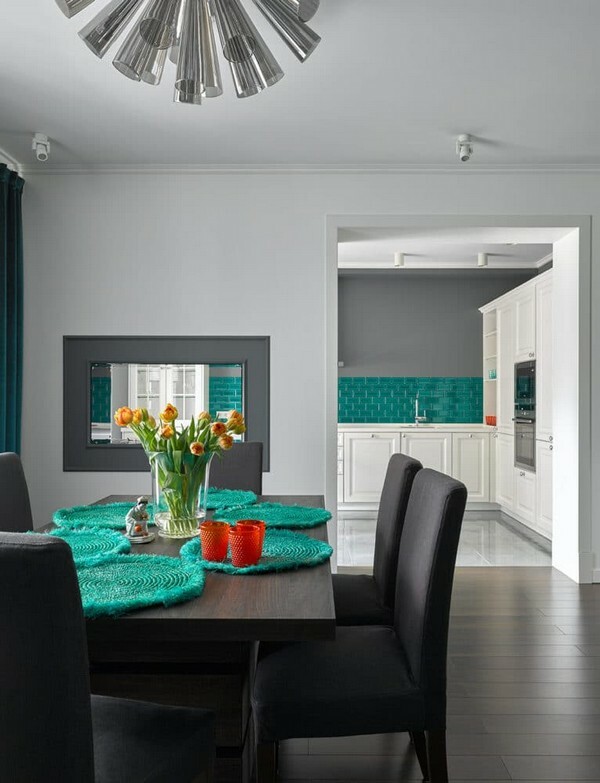 Dining chairs and a cupboard are made by IKEA, and the frame of the room are gorgeous velvet curtains of deep emerald color. 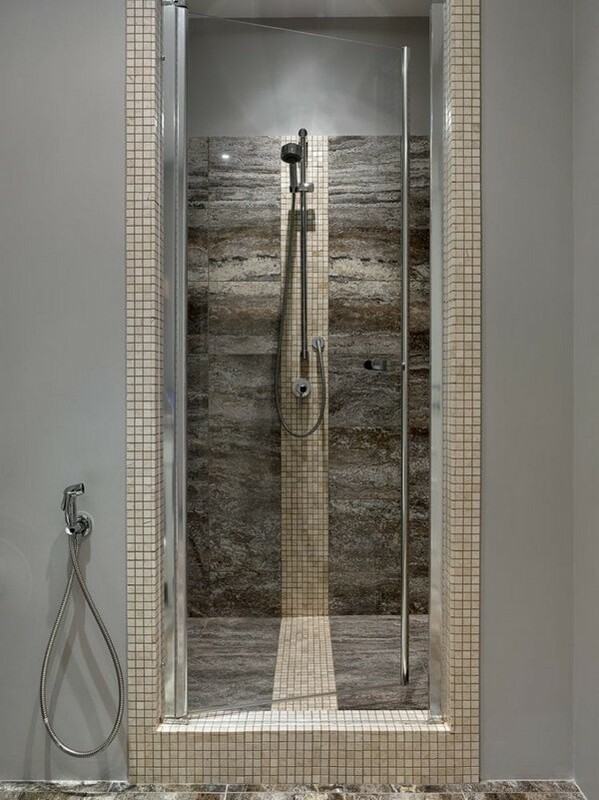 Floor and shower cabin of the guest bathroom are finished with travertine tiles. 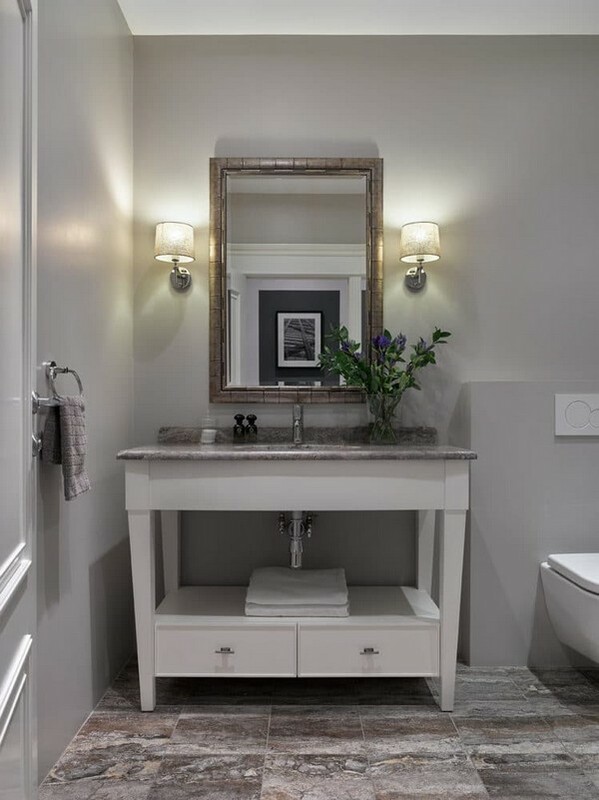 The color range is pretty reserved as well as the design of a wash basin cabinet by Caprigo. 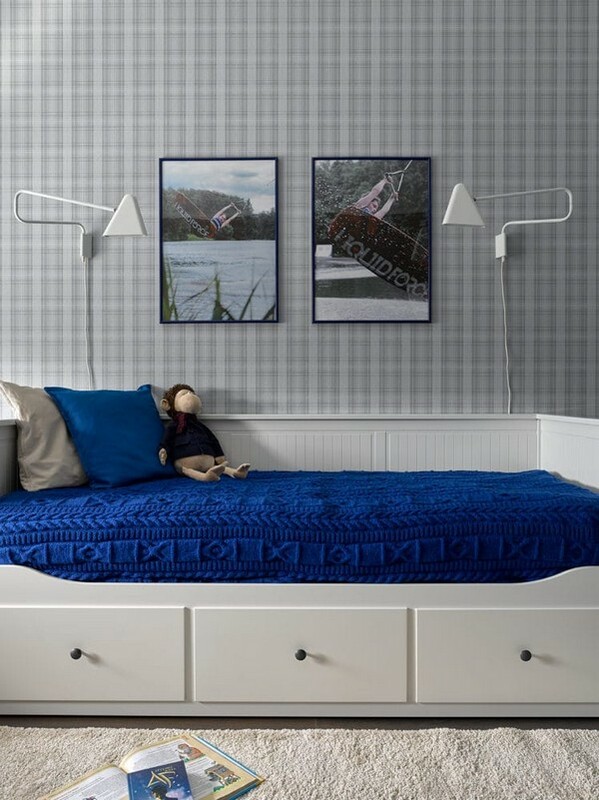 The toddler room is designed in smooth blue hues. Traditional shapes of furnishing and wallpaper with neutral pattern are coupled with cozy deep blue bedspread and lovely linen Roman blinds. A colorful element of monochrome custom-made staircase is an ochre ottoman by Crate and Barrel. The walls are decorated with a few black-and-white posters by MhLiving. 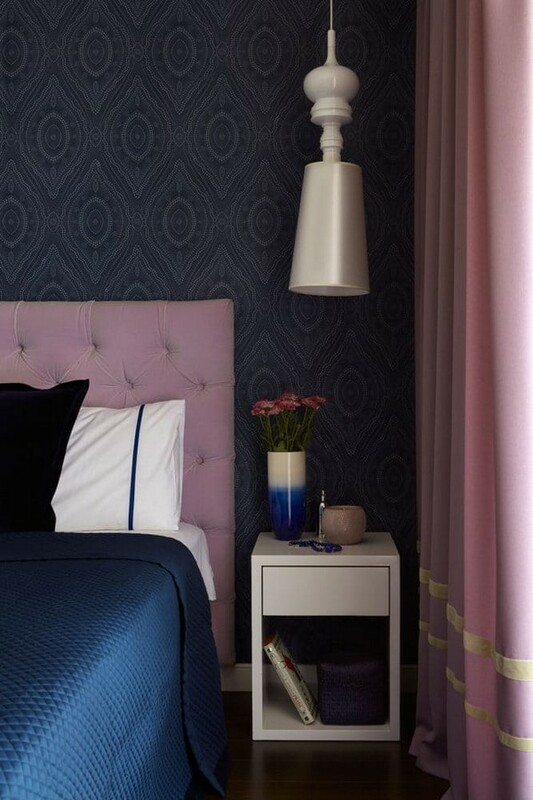 The bedroom is very elegant and all because of exquisite textile elements: a blue bedspread and a velvet decorative pillow by Ralph Lauren, a lilac velvet custom-made headboard and bed linen by Zara Home. Even more chic and style is added by emerald wallpaper by O-Design and a two artworks with beautiful landscapes. The balcony doesn’t go out of general style and color scheme of the apartment. 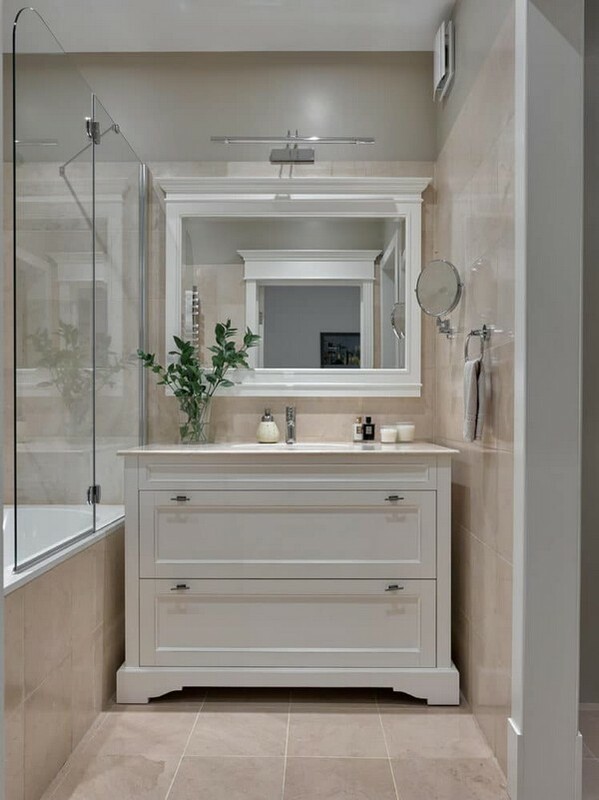 And finally, the master bathroom is finished with pastel marble tiles by Crema Marfil and paint by Little Green. Classical-style furniture and mirror are made by Caprigo and the water taps – by Hansgrohe.